Are you a drummer? and looking for an in ear monitors for drummers? If so, then don’t look any further; as your search is almost over. With this guide I’m gonna show you the Top 3 Best in ear monitors for drummers under budget. …hence why with this guide I’ll focus on cheaper but highly competitive earbuds that are going to be worth every penny you pay. Only very handful of people can afford in ear monitors that cost upwards of $500 which are considered in the professional price range. What about the drummers who’ve just started out and their entire drum set comes in that price range. This is the fundamental reason that inspired me to create this, being a former (average) drummer myself. Hence without wasting any time, I’m going to jump straight into the in ear monitors list. Hey wait, before I jump straight into the list, I’d just like to give you an overview about certain things to consider while buying earbuds for yourself. This will take just 5 minutes of your time. 1. Durability: Since you’re a drummer, you’re going to be all soaked up in sweat while doing your playset… Hence before the sound quality, you’re going to an earphone that is going to stand the test of time (and sweat). For once you can definitely compromise on sound quality, but what if your earbud breaks down in middle of a concert. You wouldn’t want that to happen, would you? This is the reason why you’re going to need a earbud that will be highly durable and sweat resistant as possible. This doesn’t means that you need to buy sports earbuds and by the way they sound terrible too. I’ll suggest to go for in ear monitors that are carved out of strong aluminum or high density plastic construction, this gives it high strength and durability and resistant to sweat too. 2. Comfort: Who would want in ear monitors that aren’t comfortable at all to wear? That’s right, No one! Make sure you try out the earbuds before you buy them. This will help in you realizing how much comfortable they actually are for you. You might to try RHA Dual Density Tips or Westone’s True Fit Foam Tips to get premium comfort from your affordable in ear monitors, what say? 3. Sound Quality: No matter how much we discuss about in ear monitors for drummers, if they don’t sound good…it’s better to throw them out of the window. Since you’re a musician yourself, you definitely deserve the best of sound quality from your earbuds, don’t you? …because a musician for once can compromise on price, but never on sound. More of talk, let's now get straight into the best Earbuds for Drummers. To be honest, I’m totally in love with these earbuds and have already featured them in our list of best earbuds under $50. They happen to be the best sound earbuds in that price bracket with audiophilic sound. I just can get enough of them. These are made especially for musicians and you might want to take my words seriously as Andrew Minarek, drummer of Threat Signal and Rick from My Electric Heart use them. What makes these in ear monitors totally awesome? These are precisely tuned by MEE Audio to suit the sound signature any musician would want from them. Frequencies they produce are almost close to flat, hence you won’t tend to find any artificial bass or extended trebles. They even happen to come along with 6.3mm adapter, allowing you to plug these directly into an amp. You even get detachable cables that not only make them easy to store but also allows you to change any faulty piece separately. Though they’re made of plastic, the built quality is nothing that can be compared with anything in the same price bracket. You even get an extra set of detachable cable with in-line microphone; for drummers who’re on the move. MEE Audio has been generous enough to throw in three set of single flange eartips, one pair of double flange and two pairs of triple flange eartips along with medium sized Comply Foam eartips coupling it along with a durable and handy carrying pouch. Though the earbuds themselves are highly durable but the provided ear tips aren’t something you want to use in your drumming sessions. SoundMAGIC E80 is the latest interation in SoundMAGIC’s E series family. 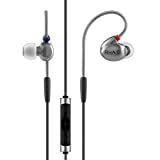 They happen to be the flagship in ear monitor model from the company. Hardened aluminium housing with reduced vibration. Music is delivered with outstanding detail and balance. Includes three types of silicone eartips in different sizes and shapes to ensure a perfect fit for your ears. Three pairs of Comply(tm) memory foam eartips in different sizes are also included for maximum noise isolation and superior audio experience. One shocking thing however is, they cost just a little north of $50. 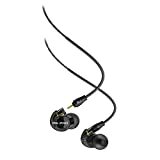 The company markets them as audiophile earphones and E80 certainly delivers without any compromise at all. Since they’re made of high strength aluminum, SoundMAGIC E80 happens to be highly durable and definitely will stand the test of times. Best part about the E80’s is its sound stage; it’s bigger and able to produce a high range of frequency without requirement of any external amplification. 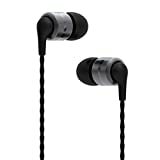 Since they’re reference model, you happen to get a much flatter sound than any earbuds in this price range or even compared to earbuds double or triple its price. SoundMAGIC had definitely changed the game regarding high quality budget earphones, when they came with E10 and they’ve done the same to reference class earphone with its E80 model. Specifications wise, they come with a 10mm drivers housed inside that aluminum body that offers frequency range between 15Hz-22kHz. Unlike your normal in ear monitors, these come with an impedance of 64 Ohms and require quite more power than any average earbuds. Cable length is 1.2m and isn’t detachable compared to MEE Audio M6 Pro mentioned above. The 3.5 mm jack is angled at 60 degress and gold plated too. Considering its price, what you get in the box is much more amazing. You get two different types of S/M/L eartips, a pair of double flange eartip along with a set of Comply eartips. We even have a cable clip and small carrying pouch. On paper the accessories may not sound like much, but be prepared for the amazement when you unbox SoundMAGIC E80. Since we’re talking about durability, why not talk about a earbud that has been carved out of stainless steel and built like a tank. Already mentioned in our list of Best Headphones for Rock Music, RHA T10i is supposedly the needle in a haystack. Where many other audio products are busy proving how their in ear monitors are the best; RHA T10i just proved it without talking much. RHA T10i are an excellent example how a premium earbud should be made like. Worn from behind the ears, RHA T10i sits comfortably in your ears for a very long time without you worrying about them falling out. The company also provides interchangeable tuning filters, allowing you to alter its sound signature on the go. It comes with Flat, Rock and Bass tuning filters out of which Flat will work well for you, since you’re a drummer. Since they’re handmade, these are engineered in such a way that it accurately reproduces all genres of music with high levels of clarity, detail and imaging. It’s built quality is completely mesmerizing as RHA T10i are molded with stainless steel metal injection. This helps if you’re travelling a lot and just put your earbuds carelessly in your bag and forget about them. They come in two versions, one with an inline microphone and one without it. RHA T10i’s package comes with 2 pairs of S/M/L dual density eartips, along with two pair of foam tips and two pair of double flange eartips. If you want to splurge more, then there’s also a dual coiled T20i which have much better quality than the one mentioned now.